September is usually one of my favorite months. The scorching heat of a midwest summer is beginning to be relieved by cooler temperatures, if only for a few hours while the weather tries to decide whether it’s ready to shed its sunkissed soil and green leaves for a more barren landscape. It can be a bit of a roller coaster, but after three months of unrelenting sun and humidity, I’m more than happy to welcome the weather whiplash in exchange for some semblance of autumn. But September always comes to me with a sense of dread. The reason for that dread is something with which most of you reading this are probably familiar with. From September until late March, the fishermen’s boats leave the harbor early in the morning in search of dolphins that migrate past Taiji this time of year. If a pod is unfortunate enough to be found, they are herded into the Cove by the use of long metal poles that are placed into the water and banged on by the fishermen. As acoustic creatures, the dolphins naturally move away from the sound and find themselves netted into the Cove, terrified, confused, and unable to escape. 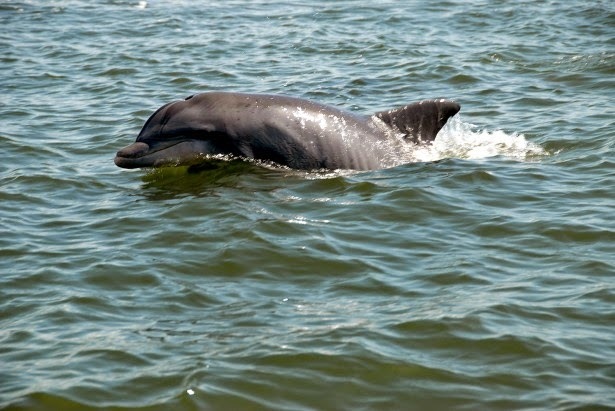 The young and attractive dolphins are taken from their families to be used in the dolphin shows often seen in marine attractions and amusement parks. They’ll never see their pod again and, if they fall prey to statistics, over half of them will die within their first two years of captivity. Those who survive will be condemned to a tank that will never be as large as the ocean and their days will be spent entertaining crowds and doing tricks, lest they have their meals withheld from them. For the dolphins left in the cove, they will spend the night worrying and waiting for what the future holds. There are no studies proving that cetaceans can feel hope. And I wonder, if they can or could, do they spend that night believing in the next sunrise, holding out for the feeling of freedom that they felt just hours before? Or do they somehow know? Do they realize there’s no way out of this nightmare and that this cursed cove is the last thing they will ever see? The morning after the drive, the fishermen return to the Cove to begin a massacre that will turn the water red and stain the beaches with the lifeblood of dolphins that will spend every last forsaken moment fighting for their lives and screaming for their families. The updated method of slaughter employs the use of a metal rod which is jammed behind the blowhole, in hopes of severing the spinal cord. While this is supposed to provide a humane death, hidden footage has revealed that death is not instantaneous nor humane(watch video here). In an effort to keep the blood from spilling into the water and being filmed, the fishermen kill the dolphins under tarps and shove wooden corks into the dolphins’ wounds. And when it’s over and the water has stilled and everything is silent, the slain bodies will be dragged to the butcher house and processed. The meat, though contaminated with toxic levels of mercury, will be sold to the people of Japan; oftentimes it is mislabeled as whale meat in order for it to be accepted as “healthy”. I discovered the horrors of the dolphin drives in 2012 when I took interest in the controversial captivity debate. As I researched the story behind captivity, I read mention of the slaughter and how the captivity industry helped fuel it. I saw the pictures and was understandably disturbed, but it didn’t really come to life for me until I saw The Cove(http://www.thecovemovie.com). The Cove is an awarding winning documentary that features former dolphin trainer turned activist, Ric O’ Barry, and exposes Taiji’s annual dolphin drive using covert techniques and undercover footage. It popped up in the “Recommended For You” section of my Netflix account and I settled in to watch it. I knew what to expect from the research I had done, but I still felt unprepared when footage of the slaughter came across the screen. I saw the innocent blood spilled in the Cove and I heard the squeals and cries of those being brutally murdered-I say murder because that’s the only word I can think of to describe it as. Nothing that barbaric and drawn out could ever be considered anything else. I saw these things happen and I cried. I am not one to cry at films. Despite being an emotional person, I find it difficult to get drawn into any film enough to legitimately shed tears. I cried, I got angry, and I cried some more. I paced my floor. I opened and closed a word document. I tried to find words to describe how I felt until I finally settled on dumbfounded. I didn’t get it. I still don’t. How could anyone intentionally seek out a creature of any kind and drive a metal rod into its spinal cord and watch as it thrashes in pain, desperate to keep living? How could someone participate in that and not be kept awake at night from the nightmares of what they had done? But somehow the fishermen of Taiji manage to do just that. It’s called “tradition”. But the practice of Sati(a funeral ritual in which a widowed woman would kill herself, usually on her husband’s funeral pyre) was called that as well. In similar fashion, neither dolphin slaughter nor Sati is or was accepted widely by the people within the country. And should something filled with such cruelty ever be considered true tradition anyway? And even if it were, traditions change because people do. That being said, the real driving force behind this slaughter is the captive cetacean industry. The meat of a slaughtered dolphin could go for $500 while one chosen for an aquarium display goes for, on average, $32,000 with prices capable of reaching figures such as $250,000. 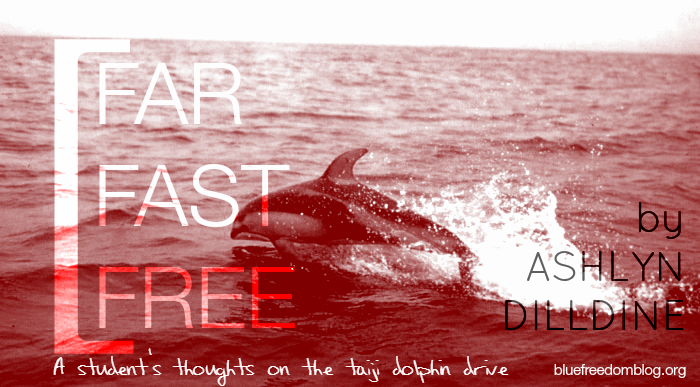 For a while after discovering what goes on in Taiji, I felt powerless. Blatant cruelty was staring me right in the face and there wasn’t a thing I could do to stop it. But then I realized that I couldn’t be more wrong. I could write letters, send emails, sign petitions, and most importantly, use my voice in such a way that there was no way anyone who paused for a moment to listen wouldn’t hear about what happens in Taiji and why it needs to be stopped. Some of you may be thinking that one voice can’t change much of anything. You’re just one voice out of millions, what good does it do you? Let me share with you what a small group of concerned people can do. In 2009, 2,500 dolphins were killed. In 2010, it dropped to 2,000. 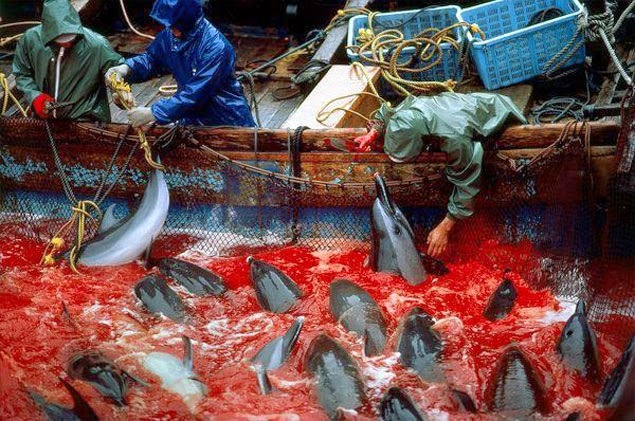 In 2012, only 800 dolphins were slaughtered. All of this is due to global pressure because groups like The Dolphin Project and the Cove Guardians answered the call to bring this cruelty to light. Why does that work? Because when you talk to someone about something that they’re passionate about, something that gets them so fired up that their voice cracks and their hands shake and their eyes glisten, how could you not be moved? This is how revolutions start. All it takes is one person to stand up and say, “No. I will not accept this.” Someone sees that person speak so bravely and a flame of inspiration ignites. And that flame touches the next person and the next and the next until the whole world is one fire because one person decided that they would not be passive. People choose to stay blissfully unaware because they’re afraid. Afraid what they find might make them feel guilty about their choices. Afraid of what others might think of them. Afraid that no matter how hard they try, they might still fail. But can the world really afford to live this way? The dolphins of Taiji can’t. Let yourself be heard. Shout it from the rooftops and demand an end to the slaughter until this kind of cruelty is something that our future generations will look back on and not be able to imagine. Because unless we do, the dolphins will continue to be massacred, the people of Japan will continue to consume toxic meat, cetaceans will continue to languish in pools in what could be argued as existence, not living. And it will continue in this vicious cycle of capture, kill, and deceive until we decide to stop it. The dolphins are counting on you. There’s a day coming where they won’t have to worry about what might happen if a boat passes by because it’s full of people who want them to be free to swim as far and as fast as they please. But it’s up to you to bring that future to them. Voiceless film update: interview with Howard Garrett Lets make Black Friday ‘Blackfish Friday’!